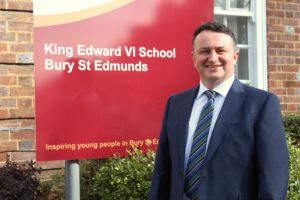 I am delighted to welcome you to King Edward VI School. Whatever your reason for visiting our website, I hope you get a sense of what it is that makes us so special, and that you are inspired to visit us to experience our work in person. Our school was founded in 1550. Known from this time as the schola Buriensis (school of Bury), we are now home to some 1600 students aged between 11 and 18. As a Church of England school, we hold dear our broadly Christian ethos and values, although we welcome students from all denominations or none. We enjoy very close links with St Edmundsbury Cathedral, through worship, voice and music. We have an enviable academic reputation, and a real desire to employ the very best techniques for teaching. This enables our students to progress to a wide range of destinations once they complete their studies with us, including the highest ranked national and international universities, first-rate colleges and rewarding careers in every field imaginable. Beyond the classroom, our extra-curricular activities are second to none. Our students can access a phenomenal range of sporting, musical, dramatic and artistic opportunities during their time with us. We offer leadership challenges at all levels. Our students can participate in the Duke of Edinburgh award, school council, and debating. They can work with our local community, with other institutions in the Bury Schools Partnership and through our 10-year partnership with the Yangjing-Juyuan Experimental School, Shanghai. Facebook and Twitter sites – they are a wonderful showcase for all that happens here.